Useung Touch, winner of last month’s Ttukseom Cup in Seoul returned to action at her home track of Busan this afternoon with some style as she defeated a field full of imported horses to win the first of co-main events. The 2011 Korean Oaks winner had a solid if unspectacular 4-year old season last year, always managing a money-winning finish but generally finding one or two too quick for her. However, her year ended with a big jump up in performance when she finished 2nd to another filly, Gamdonguibada in the Grand Prix Stakes. Returning to the capital she dominated the Ttukeseom Cup, the first leg of the “Queens’ Tour” that will decide Korea’s champion filly and mare. Today, Useung Touch (Menifee) was sent off the hot favourite, despite being one of only three Korean-bred runners in the mile-long race. In the end, she fought out a tough finish with US-bred colt Wild Myeongun (D’Wildcat), getting the better of him by just over a half a length on the line. The rest of the field trailed in a full eleven lengths behind the leading pair. Useung Touch now has 8 wins from 22 starts – but with a further 7 seconds and 2 thirds to her name and over 1 Billion won in prize money in the bank, she currently just edges Gamdonguibada (who has 8 wins but from just 12 starts) as the most successful filly or mare on the peninsula right now. Jockey Choi SI Dae felt he should have won the Grand Prix when Useung Touch started at 100/1. A rematch between the two could be very interesting. In the other co-feature at Busan, 4-1 chance Baekho Janggun (Pico Central) took a narrow win by a neck from Peter Wolsley’s old-stager Khaosan (Sunday Well). Wolsley also saddled the 3rd horse home, Ghost Whisper (Gotham City). Meanwhile, earlier in the day, Japanese jockey Joe Fujii continued his excellent form. He landed races 1 and 2 to take his tally to the weekend for 6. Fujii’s countryman Ureshi Katsunori was also on the board again but Darryll Holland’s best finish was the second on Wild Myeongun. Also at Busan, My Key (Macho Uno), a half-brother to US champion Game On Dude, recorded his 3rd career win on his 7th start. He won the 1500 metre race 4 by a comfortable 5 lengths. Up at Seoul, the feature race also went to a filly. 2012 Nonghyup Chairman’s Stakes winner Speedus (Menifee) found her way back to the winner’s circle for the first time in 2013 with a 2-length victory in the 1800 metre main event. Next week, Busan is the focus again with a small but top class field set to compete for the Gukje Sinmun Cup. Three-time President’s Cup winner Dangdae Bulpae (Biwa Shinseiki) and the afore-mentioned Gamdonguibada (Werblin) are among those currently set to run. Joe Fujii was on top form at Busan this afternoon, taking 4 winners on a day when the entire on-track foreign contingent scored victories. Fujii’s winners came in race 4 on Sinheung Gangpung (Yankee Victor) followed by race 6 on First Touch (Volponi). He completed his treble in race 7 on Miss Quick (Menifee) and wrapped things up with his fourth in race 9 on Yeonseung Gangho (Simon Pure). It was the Japanese rider’s biggest one-day haul since arriving in Busan in May last year and takes him to 54 winners in all. 24 of these have come in 2013 and he now lies in 3rd in the Jockey Championship. Fujii’s stint in Korea has been so far – controversial 9-day ban for a slow start aside – a great success including winning the nation’s most prestigious race, the Grand Prix Stakes at Seoul last December. I predict a big future for @joefujii1 he can make a horse run fast. We will see him in the Uk! Holland himself was in the winner’s circle today although not necessarily in the manner he would have liked, dead-heating in the feature race on hot favourite Amell’s Atom (Menifee) with 2nd favourite Sand World (Star Dabbler). Amell’s Atom gave Peter Wolsley his 3rd success of the day, following up wins in race 1 with Strong Rain (Turbulent Storm) and race 8 with Heukdancer (Vicar). To complete a good day for the foreigners on the south coast, Fujii’s countryman Ureshi Katsunori also grabbed a winner, taking race 3 on Plein Soleil (Exploit). Another one of those low-key weekends between big races but plenty to keep us occupied over the next three days. While the Derby contenders are mainly keeping their powder dry before the big race at Seoul on May 19, there are a few possibles going this weekend. Peter Wolsley’s Amell’s Atom (Menifee), 4th in the KRA Cup Mile, will be in action at Busan on Friday, racing alongside Global Gangja (Pico Central) who put in a less than impressive performance in the first leg of the Triple Crown. At Seoul, Cheonha Jeongbuk (J Be K), with 4 wins from 5 starts is an action on Saturday. He’s ineligible for the Classics but will be well worth watching as he moves up to class 3 over 1800 metres. 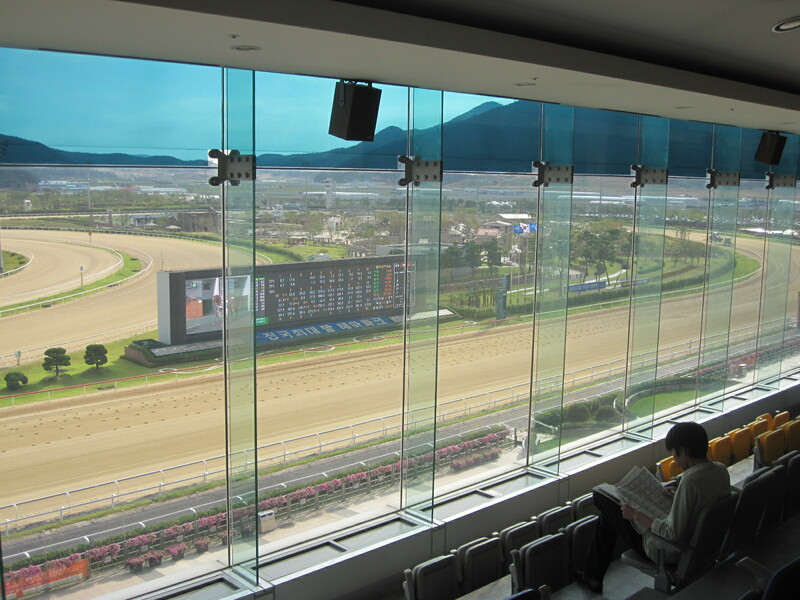 The pick of the action is at Busan on Sunday with a pair of class 1 tests. 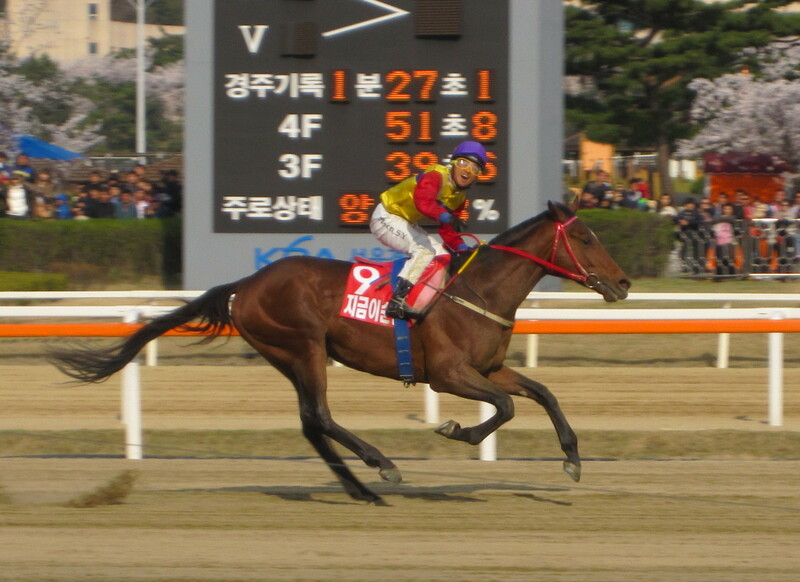 Ttukseom Cup winner Useung Touch (Menifee) faces foreign opposition in the first of these. Yeonggwanguijehyun (Rockport Harbor) and Wild Myeongun (D’Wildcat) are likely to give her plenty to think about. In the second co-feature, Peter Wolsley saddles both his old-stager Khaosan (Sunday Well) and one-time stable star Ghost Whisper (Gotham City) in a competitive looking 2000 metre handicap. One-time Classic winner Dongseo Jeongbeol (Vicar) will be among those providing stiff competition. Seoul Race Park’s novelty race on Owners’ Cup day between an athlete, a racehorse and an off-road Sports buggy, ended in an unexpected win for the human. Gyeongbuk University student Lee Jae Ha on his way to beating a horse and a car at Seoul Race Park on Sunday. 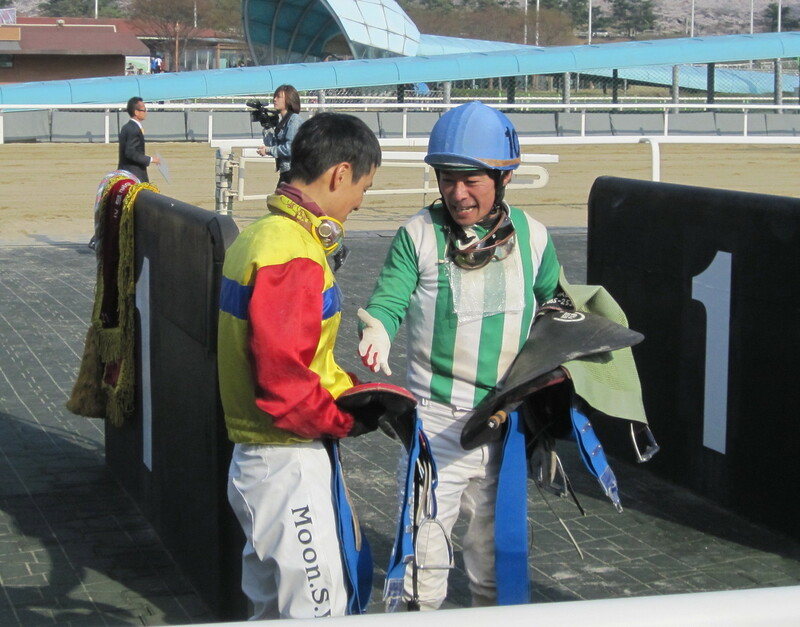 Gyongbuk University student Lee Jae Ha, who started the handicap race at the furlong pole, could have had his feet up with a big cigar by the time the slow starting buggy crossed the line in second, trailing a sandstorm in its wake, with the horse back in third. Lee, running on a length of matting that was stretched for 200 metres over the deep sand of the home straight, finished the race in 25.43 seconds. The buggy completed its 450 metres in 26.32 seconds while the racehorse, an 8-year-old mare called Blessed (The Groom Is Red) took 28.43 seconds to complete 400 metres having been very slow out of the gate. 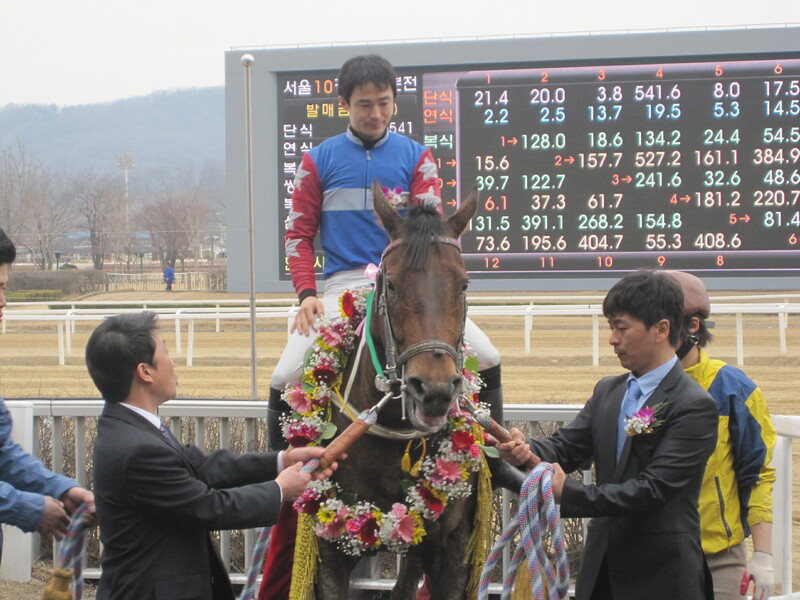 Jockey Lee Gi Hweoi rode the mare who was actually retired from racing in 2010 and has been retrained as a recreational horse so perhaps wasn’t in peak race condition. Throughout the day, punters had been able to “vote” on which they thought would win with all those correctly picking the human (significantly fewer than those who went for the other two options) being entered into a prize draw. The event was part of the KRA’s push to get more people into the track and coincided with a special “Beginners and Couples Zone” opening on the first floor of the grandstand. More on that shortly. Jigeum I Sungan stormed to a dominant victory in the Owners’ Association Trophy at Seoul Race Park this afternoon in the process cementing his place as the top Korean-bred horse at the track and handing a first defeat on Korean soil to Feel So Good. The 2012 Korean Derby winner, Jigeum I Sungan (Ingrandire) has shown improvement with every run and today was no exception. Despite dropping back to 1400 metres and facing Feel So Good (Ft.Stockton), the first Korean-bred horse to win a race in the United States and who had won his first 3 Korean starts without breaking into a gallop, Jigeum I Sungan was sent off the heavy favourite. While Feel So Good was quick out of the gate and into an early lead there was never a stage when the result looked in doubt. As they entered the home straight, Moon Se Young brought Jigeum I Sungan around the outside of the field and into contention while Kim Ok Sung got no response from Feel So Good. After that it was just a matter of how much he would win by, jockey Moon spending most of the final furlong contemplating how he would pose for the cameras on the finish line. 7 lengths was the ultimate margin. Behind him, two rank outsiders got the closest. New And Best (Trick Of Fate) was guided into 2nd by Japanese jockey Yukio Abe at odds of well over 200/1 while coming in third was 125/1 Jeumeundeungi (War Zone). Feel So Good trailed over the line in 10th and was later found to be lame in his left foreleg. 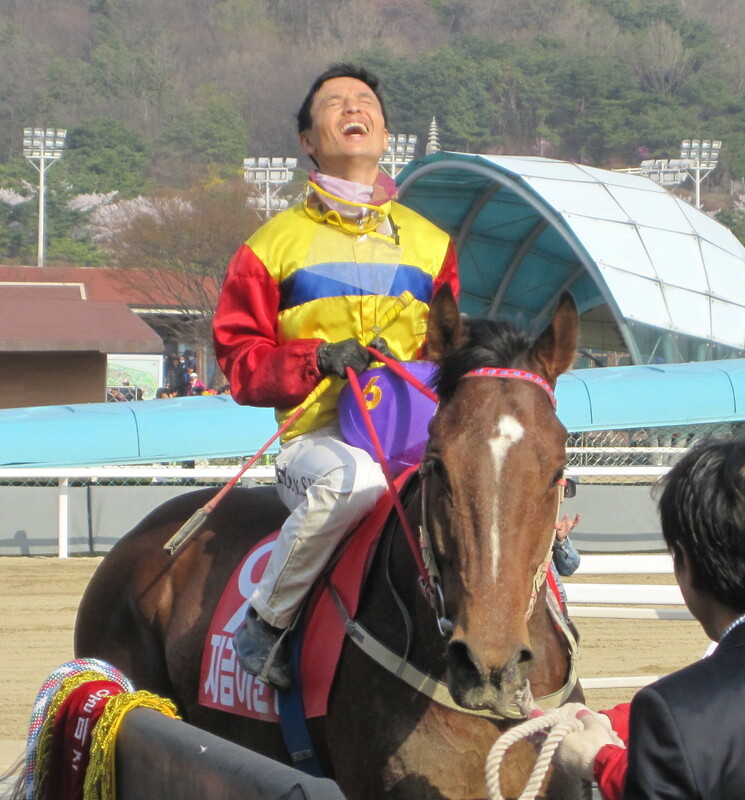 Jigeum I Sungan now has 10 wins from 19 career starts – with 8 of those wins coming in his most recent 11 starts. The last horse to beat him was Dangdae Bulpae as the Busan superstar romped to his 3rd consecutive President’s Cup last November. Next time the face each other, the younger horse should be much more competitive. 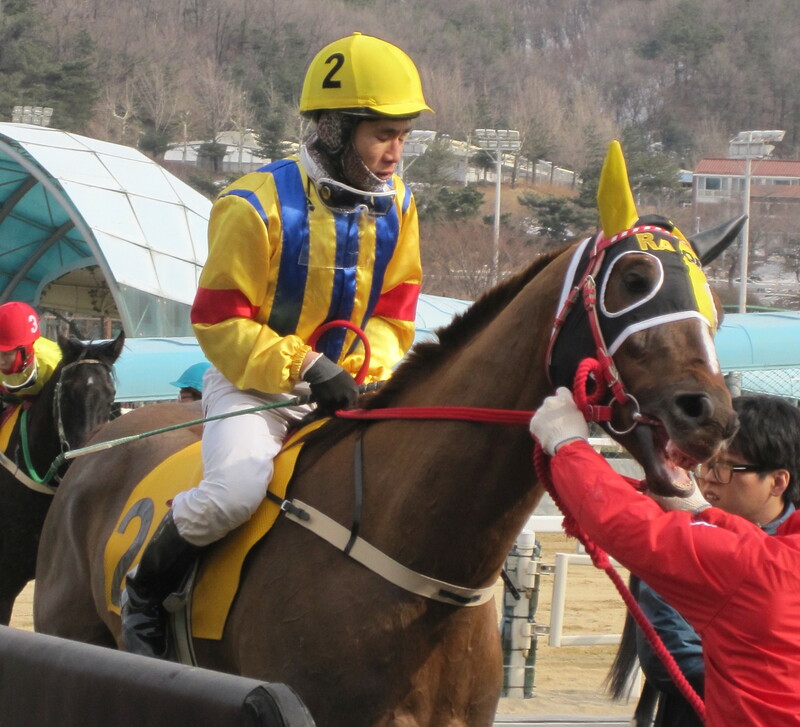 Winning jockey Moon Se Young spent the first 3 months of this year riding in Macau, notching 7 winners. The 2012 Champion has given his rivals a big head start but, having grabbed 5 winners over the course of the weekend and 10 in total since returning, it would be a brave man who’d bet against him grinding his rivals down over the rest of the season. He had missed 3 wins on this horse while in Macau but Moon showed his delight on being back on him with the kind of celebration he used to reserve for his former favourite mount, Bally Brae. Bally Brae became one of the best horses of his decade. If Jigeum I Sungan – his name means “This Is The Moment” – keeps up this form, it is very possible he may end up remembered as one of the best of his. Feel So Good, who became the first ever Korean bred horse to win a race in the United States, steps up to Stakes level this weekend and runs smack bang into 2012 Korean Derby winner Jigeum I Sungan in the Owners’ Association Trophy at Seoul Race Park this Sunday. It is a mouth-watering clash. Jigeum I Sungan has appeared to get better and better since his Derby triumph nearly a year ago while Feel So Good hasn’t been troubled in his three Korean starts to date. 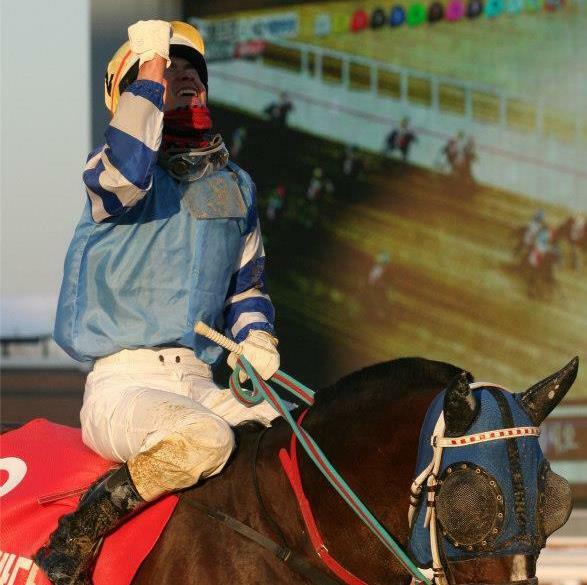 Both colts are 4-years-old and while Jigeum I Sungam definitely prefers lengthier challenges, it is still set to be a great occasion. Sunday sees the Seoul Owners’ Association Trophy take centre stage with current hottest property in Korean racing Feel So Good likely to make his Stakes racing debut. On the same afternoon, however, the KRA has decided to host a slightly different contest in the shape of a horse vs car vs runner race. The horse will be an 8-year old mare called Blessed (The Groom Is Red), who won 2 of her 30 starts before being retired and retrained as a riding horse in 2010. She will start at the 2 furlong pole along with a “Premium SUV”. Given a furlong’s head-start will be 22-year-old athlete Lee Jae Ha of Gyeongbuk University. 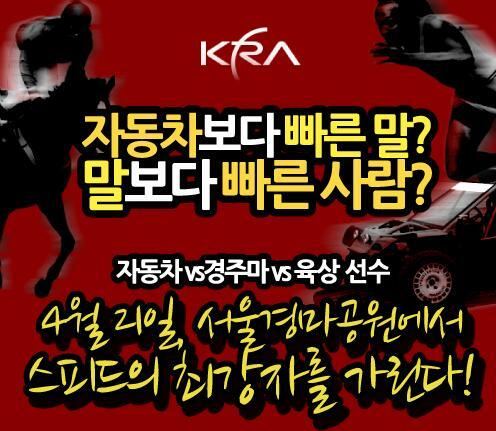 The KRA isn’t offering betting on the event but instead is inviting people to “vote” on its website for who they think will win with all successful votes being entered into a prize draw (which sounds suspiciously similar to the way legal “gambling” on Chinese horse races happens). With the stunt being given some coverage in local media and being held on a weekend where the cherry blossoms are likely to be out around the track, the KRA hopes to get more casual racegoers along.